The brachiobasilic fistula was first described by Cascardo in 1970 and Dagher in 1976. In this technique, the basilic vein is anastomosed to the brachial artery in the end-to-side manner in the antecubital fossa and later superficialized and transposed anteriorly to make it amenable to needle puncture. Advantages are that it produces a long length of the straight superficial vein with a high flow rate. The basilic vein being in deeper plane is naturally protected from damage caused by venipuncture, making it accessible in case the distal vein is not available. However, the disadvantages of this technique are need for long length of incision, increased chances of hematoma formation, requirement of regional or general anesthesia, long duration of surgery, increased stay in the hospital, and thus increase in the overall cost incurred. An arteriovenous fistula is the gold standard for hemodialysis access. The order of preference as given by the National Kidney Foundation Kidney Disease Outcomes Quality Initiative guidelines suggests radiocephalic, brachiocephalic, and brachiobasilic transposition fistulae and then prosthetic grafts as vascular access options [Table 1]. In our modified technique of brachiobasilic arteriovenous fistula, we tried to overcome the above disadvantages of the conventional technique of brachiobasilic fistula. Our modified technique eliminated the need for vein superficialization in brachiobasilic fistula, and it was performed by a small incision under local anesthesia at the elbow region. This significantly reduced the morbidity associated with the conventional technique. This study aims at analyzing the various factors affecting the outcome of proximal arteriovenous fistula done by the modified technique. It also aims to evaluate the outcome regarding patency, maturation time, flow rates, ease of access, and complications and to compare them with studies done with conventional technique of brachiobasilic fistula. A single-center, single-surgeon retrospective analysis was carried out from January 2010 to December 2014. All patients suffering from chronic kidney disease found to have veins unsuitable for distal fistula or had a previously failed distal fistula were selected for proximal arteriovenous fistula by the modified technique. In most cases, where the distal veins were clinically adequate, distal (radiocephalic) A.V fistula was performed. In all cases, where the veins were clinically found to be inadequate, a preoperative Doppler study was done. All patients who underwent proximal arteriovenous fistula creation but did not undergo hemodialysis during the study, expired before the fistula was used for hemodialysis, or underwent kidney transplant after fistula creation during the study were excluded from the study. The plan of treatment and operation was explained to the patient. Written informed consent was taken from all patients for the procedure as is the usual practice for retrospective analysis of records; permission from the institution was obtained. The patient and relatives were instructed to take care of the arm, on which the fistula was planned. All the patient information was collected in a pro forma. The comorbid conditions were noted. All cases were done under local anesthesia under loupe magnification. In this technique, before incision, vein mapping was performed to mark the course of cephalic vein and basilic vein under venous tourniquet. A small S-shaped incision of about 5-cm length was taken above the elbow region, over the medial aspect of the lower third of the arm. The basilic vein was dissected. The brachial artery was now sought. Arterial and venous diameters were measured with calipers intraoperatively. A side-to-side anastomosis was planned between basilic vein and brachial artery. 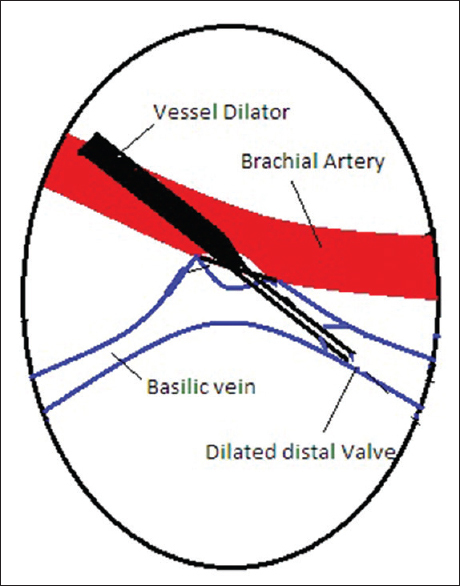 After completion of the posterior wall of the anastomosis with 7–0 polypropylene, a long arm vessel dilator [Figure 1] was introduced into the distal part of the basilic vein to dysfunction the first valve toward the wrist end [Figure 2]. The retrograde flow in the distal vein was confirmed by flushing it with heparinized saline and looking for thrill on the forearm [Figure 3]. Once this flow was confirmed, the anterior wall anastomosis was completed. We did not dissect or transpose basilic vein. After completion of anastomosis [Figure 4], bruit and thrill over the forearm were confirmed, and the incision was closed. Noncompressive dressing was given. Postoperative anticoagulation in the form of injection low-molecular-weight heparin subcutaneously single dose and tablet aspirin 75 mg. Relevant instructions about care of operated sidearm were given to the patients and their relatives. Maturation time was defined as the time between creation and the first cannulation. In our case series, the decision of cannulation was made by the nephrologist. Cannulation of the fistula was done between 4 and 6 weeks. Success was defined as the ability of the fistula to be successfully cannulated at the end of maturation time and allow adequate flow rate for the sustenance of hemodialysis for a period of minimum of 3 h on hemodialysis machine without recirculation. All cases where the fistula could not be cannulated for hemodialysis were considered as a primary failure. Postoperative close monitoring was done to detect complications. The presence of bruit, thrill, and postoperative complications was evaluated after 1 week and 1 month. The maturation time required was noted. Ease of access was analyzed by the presence of dilated veins at the time of cannulation and whether successful cannulation could be achieved in single first prick. The date of successful cannulation was noted. Patients were initially followed up at 3, 6, and 12 months and thereafter yearly follow-up was done to determine the patency, flow rates, and postoperative complications. The demographic and operative details were obtained from hospital records, follow-up visits, and personal phone calls to each of the patients included in the study. The data were analyzed using Statistical Package for the Social Sciences version 20 (IBM Corp., IBM SPSS Statistics for Windows, Armonk, NY: USA). Student's t-test was used to find the differences. Chi-square test was used to look at the association. Regression was used to find predictors or risk factors. A total of 185 proximal arteriovenous fistulae were created for hemodialysis from January 2010 to December 2014. Of which, 171 cases done by the modified technique, which met the inclusion criteria and were followed up, were included in our study [Table 2]. The age range was from 25 to 82 years of age, with maximum patients belonging to the age group of 51–60 years. The mean age was 57 (± 12.03) years. Majority of the patients were male (n = 91). Male-to-female ratio was 1.13:1. In our series of 171 patients, majority of the patients were found to be suffering from diabetes mellitus (DM) (n = 111, 64%). The success rates between the two groups (DM vs. non-DM) were comparable, and the difference was not statistically significant (P = 0.553). The arteriovenous fistula usually takes 4–6 weeks for maturation. Once mature, it allows repetitive cannulation and consistent flow rates to allow hemodialysis. Average maturation time in the current study was 46.7(± 4.17) days. We have considered that flow rates of more than 250 ml/min are usually required for the sustenance of dialysis and its adequacy. In our case series, of the 136 successful cases, 80 (58.8%) cases had an initial flow rate of 250 ml/min on maturation. The primary patency rate is defined as the interval from the time of fully functional access placement until any intervention is designed to maintain or reestablish patency or access failure. No interventions were used for the salvage of fistulae in our study in case of failures. Hence, we have only primary patency rates. 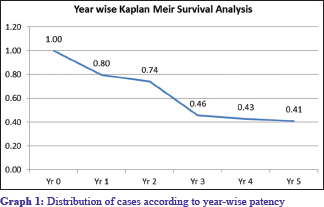 Primary patency rates were 79% at the end of 1st year, 74.2% at the end of 2nd year, 45.7% at the end of 3rd year, and 40.2% at the end of 5th year [Table 3] and [Graph 1]. The sudden drop in patency rates in our case series is due to death, discontinuation of dialysis, irregularity in dialysis after 2–3 years due to monetary reasons, and poor maintenance of vascular access. The data related to functioning fistulae were obtained from frequent examinations in the dialysis unit. The dialysis technicians were asked for their impression of the fistulae and their level of satisfaction with them. They were asked to rank various factors, including ease of finding the vein and feeling a thrill, ease of cannulation, number of trials made to insert the needle properly in the vein, frequency of needle displacement, flow through the fistula, and patient comfort. Of the 136 cases which could be successfully cannulated, 110 (80%) cases could be cannulated with ease in the first prick itself. For rhe rest 26 cases, there was difficulty in finding vein for access [Table 4]. Access over forearm was possible in 117 (86.1%) cases. This indicated easy access in majority of our patients. Of the 19 patients where forearm veins could not develop, in 16 patients, vascular access could be gained in the cubital fossa, and the rest required vein superficialization [Table 5]. Complications were seen in 7.1% of patients. Distal edema was the most common complication seen in nine patients. None of these cases were associated with fistula failure or required the fistula to be closed. Steal syndrome was seen in three cases. Of the 171 cases, there were 51 deaths. However, none of the deaths were related to fistula complications. Three (1.6%) patients in whom fistula did not develop adequate forearm veins underwent basilic vein superficialization. The advantage of this technique is that in case the forearm vein fails to develop due to inadequate retrograde flow, the side-to-side anastomosis allows antegrade flow and development of the basilic vein proximally. 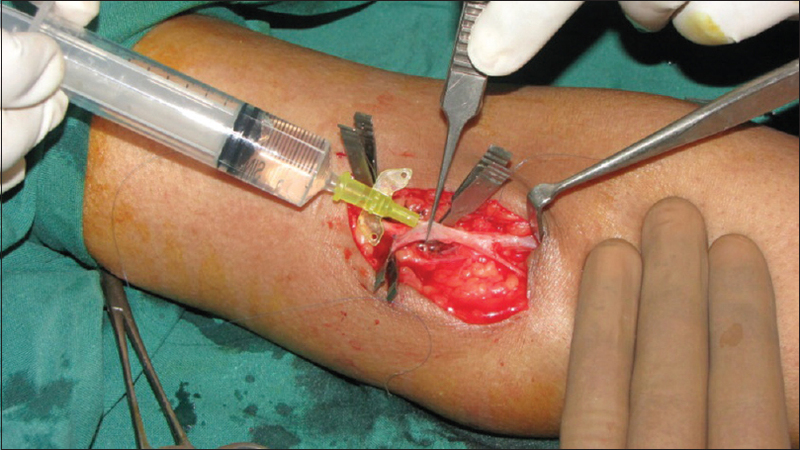 Two patients with vein superficialization have successful cannulation, with one case failed. All the risk factors were tabulated and adjusted in the log regression table [Table 6], and it was found that comorbidities such as DM, coagulopathy, atherosclerosis, or the presence of previous fistula do not significantly affect the outcome of proximal fistula by the new technique. Cases where vein diameter is <2 mm are associated with more failure rates, with the difference not being statistically significant (P = 0.604). However, the absence of bruit/thrill on table is associated with a significant failure rate. Proximal fistula by the new technique is four times more likely to fail in the absence of bruit/thrill (P = 0.006). The conventional brachiobasilic transposition fistula has been proven to be superior to prosthetic grafts with respect to long-term patency and complications. However, they have their share of disadvantages. The percentage of patients with DM in our study was 64%. In similar studies done by various authors,,, on transposed brachiobasilic fistula, the percentage of DM patients ranged from 56% to 62%. DM is the most important comorbidity in patients of chronic kidney disease. In our case series, we had four patients with coagulopathy and two patients with atherosclerosis as risk factors. Patients with coagulopathy and atherosclerosis are more likely to suffer from primary failure of proximal fistula (50% failure rate) as seen in our case series. The difference between the two groups was not found to be statistically significant (P = 0.368). Konner et al. observed that AV fistulae with flow rates <200 ml/min are likely to thrombose. Robbin et al. considered an ideal flow rate of 350 ml/min for successful cannulation of arteriovenous fistula. Flow rates are an important determinant of the long-term patency of arteriovenous fistula. Initially, on cannulation, the flow rates were found to be <250 ml/min in many cases; however, after repetitive cannulation, as the fistula becomes more mature, the flow rates have been found to improve to more than 250 ml/min. In our case series, of the 136 successful cases, 80 (58.8%) cases had an initial flow rate of 250 ml/min on maturation. The average maturation time in various studies done on transposed brachiobasilic fistulae ranged from 33 to 96 days.,,, The average maturation time in our study was 46.7 days [Table 7]. In the case series by Koksoy et al., the primary patency rate for conventional brachiobasilic fistula was 86% at the end of 1 year and 73% at the end of 3 years. The case series by Hossny echoed similar findings with cumulative patency rate of 87% at the end of 1 year and 75% at the end of 2nd year. In a study by Lee et al., the primary patency rate at the end of 1 year was 81% [Table 7]. The primary patency rates were 79% at the end of 1st year, 74.2% at the end of 2nd year, 45.7% at the end of 3rd year, and 40.2% at the end of 5th year in our study. In a study done by Hossny, 28.6% of patients with transposed brachiobasilic fistulae developed complications, most common of which was edema (20%) and hematoma formation (7%). In our study, due to small length of incision, hematoma was not seen in any case. In the case series of Lee et al., the incidence of complications was 18.25%, with the most common complications being edema, steal syndrome, and thrombosis. In the case series of Koksoy et al., the complication rate was 14.1%. The complications are wound infection (4%), bleeding (4%), and aneurysm (6.1%). Failure rates in other series ranged from 12% to 20%. The primary failure rate in our case series was 20.5%. Hossny compared the ease of access between elevated and transposed brachiobasilic veins. They reported that maximum dialysis nurses were satisfied with the transposed brachiobasilic vein as compared to elevated brachiobasilic vein (53.3%). This was due to the anterior position of the transposed vein in the arm which allowed easy access. In our study, 86% of patients developed forearm veins due to retrograde flow. This allowed easy access in 80% of our patients. The complication rates were far lesser than the conventional technique of brachiobasilic fistula. The modified technique proposed can be an important alternative to conventional proximal fistula. The authors would like to thank the consultants of the department of Medicine and consultants and staff of the department of nephrology. Dagher F, Gelber R, Ramos E, Sadler J. The use of basilic vein and brachial artery as an A-V fistula for long term hemodialysis. J Surg Res 1976;20:373-6. Sahasrabudhe P, Dighe T, Panse N, Deshpande S, Jadhav A, Londhe S, et al. Prospective long-term study of patency and outcomes of 505 arteriovenous fistulas in patients with chronic renal failure: Authors experience and review of literature. Indian J Plast Surg 2014;47:362-9. Lee CH, Ko PJ, Liu YH, Hsieh HC, Liu HP. Brachiobasilic fistula as a secondary access procedure: An alternative to a dialysis prosthetic graft. Chang Gung Med J 2004;27:816-23. Maya ID, O'Neal JC, Young CJ, Barker-Finkel J, Allon M. Outcomes of brachiocephalic fistulas, transposed brachiobasilic fistulas, and upper arm grafts. Clin J Am Soc Nephrol 2009;4:86-92. Koksoy C, Demirci RK, Balci D, Solak T, Köse SK. Brachiobasilic versus brachiocephalic arteriovenous fistula: A prospective randomized study. J Vasc Surg 2009;49:171-7.e5. Konner K, Nonnast-Daniel B, Ritz E. The arteriovenous fistula. J Am Soc Nephrol 2003;14:1669-80. Robbin ML, Gallichio MH, Deierhoi MH, Young CJ, Weber TM, Allon M, et al. US vascular mapping before hemodialysis access placement. Radiology 2000;217:83-8. Keuter XH, De Smet AA, Kessels AG, van der Sande FM, Welten RJ, Tordoir JH, et al. Arandomized multicenter study of the outcome of brachial-basilic arteriovenous fistula and prosthetic brachial-antecubital forearm loop as vascular access for hemodialysis. J Vasc Surg 2008;47:395-401.